When searching for things to do in St Petersburg, FL, paddleboarding should definitely make your list. There are scenic tours of local classics like Shell Key and even exciting moonlight rides. Burn calories while experiencing a leisurely walk on the water to see some of the most iconic sites St Pete has to offer — go paddleboarding. Join the rage and come rent a paddleboard for a day! Standup paddleboarding, also called SUP, is a unique and exciting way to see the spectacular views that St Pete promises to deliver, while getting a great workout. You can rent for just an afternoon, or even for a whole week. Some locations even offer free delivery and complimentary introductory lessons. Being in the ideal location with us here at Inn on the Beach, you can choose to either walk or take a quick car ride to the paddleboard rental location of your choice. Get in on this new fun and exciting way to experience St Pete Beach. Whether you are spending the day in Clearwater, Treasure Island, Pass-A-Grille, or St Pete itself, there are plenty of places to rent a paddleboard. Don’t miss out the fun, even if you are new to it, one-on-one lessons are available at many of the standup paddleboard rental locations in St. Petersburg. All you need to know is how to swim, and you are on your way to seeing the breathtaking sights of St Pete from the best angle. With better views of the water below and the ocean on the horizon, it’s no wonder so many people are choosing to go with paddleboard rentals these days. Not to mention a quick lesson can make anyone proficient enough to paddle the day away. Reservations aren’t always necessary with so many places to rent, but if you have a specific place in mind, checking online or by phone could make your planning smoother. For family trips, it’s always good to know that parental consent is needed for minors and group pricing is typically available. The Corraline is bright and cheerful, features one-bedroom (king bed), a large walk-in closet, and a fully-equipped kitchen. The living-dining area looks out on the tropical plants surrounding your private patio which is just steps away from the white sandy beach. This private apartment sleeps two adults. The Sunset overlooks the courtyard allowing the Pass-A-Grille sunshine to enter this bright and sunny room. 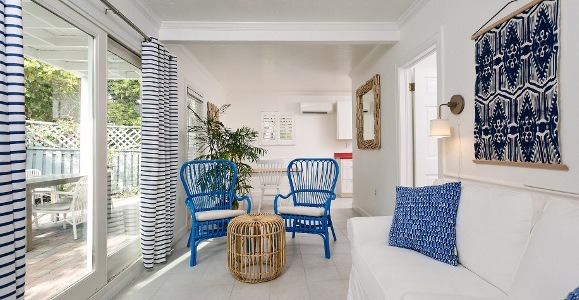 Your private balcony welcomes views of the gulf in gorgeous Pass-A-Grille. Persimmon features many windows to take advantage of fantastic natural light and landscaped gardens. The Persimmon does have a kitchenette and the bathroom has a shower. The Gardenia is bright and spacious with its own private balcony with views of the gulf. The sleeping area has a queen bed, so the room accommodates two people. Enjoy the views from your comfy couch or from the Adirondack chairs on your private balcony. Fill the cooler provided with your beach snacks and head for the sand!